Probably not many people know that when OpenRules was founded in 2003, we initially positioned ourselves as a Semantic Web company. However, absence of practical results at that time forced us to limit our ambitions to Business Rules Management. As a result, we created an open source product that allowed business analysts to represent their business logic and then a rule engine effectively executed business rules – these capabilities quickly brought tangible values to our customers. Over the years, OpenRules, like other popular Business Rules and Decision Management products, was successfully used by many companies worldwide to build practical decision-making systems. b) Business rules (such as decision tables) to represent the relationships between decision variables. Then a rule engine executes the decision model to find an answer to a certain business question, e.g. calculate insurance premium or determine loan eligibility. The last 15 years resulted in serious progress in creating user-friendly interfaces for decision modeling. Now we even have the first standard “DMN – Decision Model and Notation”. Probably the most important achievement is the fact that the objective to move control over business logic from IT to subject matter experts became a reality. However, today’s decision models force human experts to describe almost ALL relationships between decision variables using business rules which may become very complex and include various calculation formulas, filters, iterations, etc. How to minimize human involvement? Decision Optimization (Prescriptive Analytics) to apply an optimization engine to explore relationships not covered by business rules and to find not one but multiple alternative solutions, and even optimal solutions. And finally, I want to share my answer to the question asked during DecisionCAMP-2017 Q&A Panel: What is the next “killer” application for Decision Management? 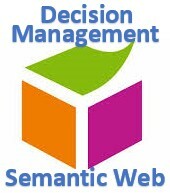 Looking forward to more suggestions for a productive cooperation between experts in two related fields: Semantic Web and Business Rules&Decision Management.